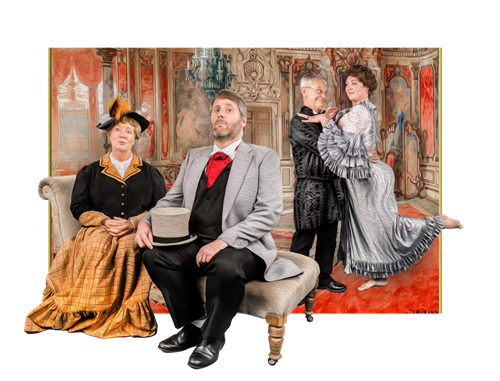 Tudor Players' latest offering is a French farce written by George Feydeau and Maurice Desvallieres. Interestingly the least amusing part about the play is the titular, middle act. This is where the extra marital shenanigans between Phil Gascoyne's Monsieur Boniface and Anita Gilbert's Madame Cot take place. However the hotel set is an intricate, terrific piece of artistry from Hansel D'Roza and Roger Bingham. The latter also expertly directs the show with a cast of 18. Far more laugh out loud and entertaining are the first act and third act which take place at the Boniface home. Here the illicit couple plan and subsequently try to hide their backfiring mischief. Relatively innocent parties in all this are the spouses of the would-be adulterers. Edwina Gascoyne plays Madame Boniface and Rod Duncan plays amateur ghost-buster and architect Monsieur Cot. Much of the fun comes as real life husband and wife Phil and Edwina Gascoyne's dialogue comes at the expense of the other as the Bonifaces bicker. Edwina asks Phil which material of two he prefers. Naturally she chooses the one he didn't pick. When Edwina says she'd throw herself at a man, Phil feigns concern with a no. But an aside to the audience is, "she'd crush him". Joe Thompson and Charlotte Gascoyne star as young couple, Maxime and Victoire. Bill Darwin is Monsieur Martin. His four daughters with the spooky song are Chloe Winter, Hannah Fagan, Lila Gilbert and Charlotte Rawlings, John Fereday is Anniello the hotel owner and John Moran plays Georges the bellhop.